Anyways, last night when I got back from a long day in the library I checked my post and found that the university had sent me my grades for my two previous assignments. After staring at the envelope for about 30 minutes and refusing to open it, I finally did and to my surprise I got 80% for both assignments and came first in my class! I have never experienced such joy before! It was amazing! All this hard work of spending hours in the library paid off! I wonder what I'll get for my essay? Other than that, I celebrated last night by going to two really good friend's home and sat there talking to them for hours. It's funny how crazy these two guys are - The one is a fatherly figure whilst the other motherly. 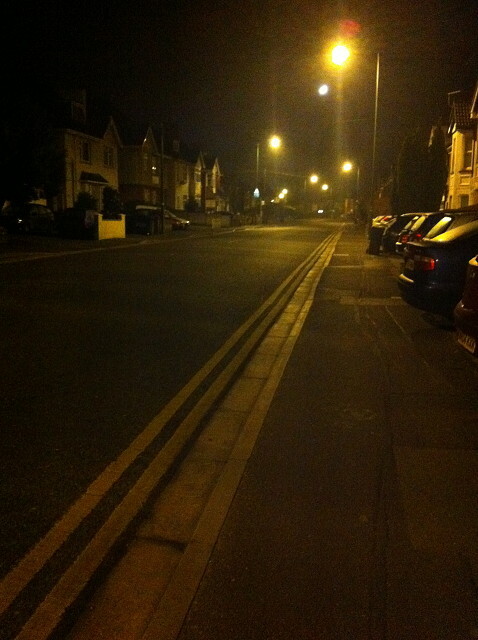 The photo above was taken when I walked back to the university in the quiet and empty streets at 1am. It was a bit nerve wrecking walking alone in the dark for 6km but at the same time it was wonderful since I got a lot of time to think. It's also a bit funny now that I think about it. The whole 6km I walked in the dark I was constantly in "fight/defense" mode. I guess it's something you never get rid of growing up in South Africa. I'm leaving for the weekend. Going to Cattistock so I'll probably not leave another post on here until Monday.